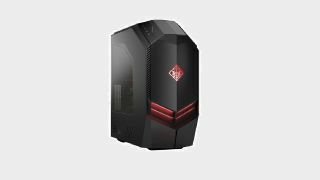 The frenzied season of Black Friday deals is upon us, and HP has a pretty strong headliner taking 15% (about £250) off it's Omen 880-139na gaming PC now in the HP store. That's a GTX 1080 Ti powered gaming beast for £1,800 at a time when GPU prices are starting to rise again, and it packs in a 3.7-4.7 Ghz Core i7-8700K, 16 GB of memory, and a 256 GB SSD to complement it's 2 TB HDD. This thing will easily crush the current generation of games at max settings and with tool free access and two hot-swap bays is ready to upgrade if you decide to pop an RTX 20-series in there later, or add on some RAM. While it's lacking a Thunderbolt 3 port, it is otherwise loaded with connections, with four USB 3 ports (two of them Type-C) and two slots for USB 2.0. It's equipped to become the centrepiece of your media setup with HDMI and three DisplayPort outs as well, and is liquid cooled so it won't melt under heavy load. For stuff to play on your shiny new PC or a TV or monitor to plug it into, skip over to our Black Friday PC deals page and our huge Black Friday game deals hub which we'll keep updating until the deals stop coming or the heat death of the universe, whichever comes first. Core i7-8700K | GeForce GTX 1080 Ti | 16GB DDR4 A mighty 1080 Ti powered gaming PC at an awesome Black Friday price. HP's built an excellent machine that will endure well into the next generation of gaming and is designed to be easy to upgrade as well, complete with liquid cooling in a sleek, angular case with a glass side panel. For a build packing this hardware we'd normally expect to pay over £2,000 even assembling it ourselves, so this HP deal looks very attractive (especially since you don't have to do any of the labor yourself, and it comes with a warranty). If you need a gaming PC this is one of the best Black Friday deals we've seen thus far, a great machine that's future proofed to last several years and is ready to upgrade and expand well beyond that.